To obtain the maximum thrust in discharging a projectile from an electric gun, the circular resistance and the reactance of the induced current paths in the projectile must be substantially equal. However, due to the slip — the difference between the speed of the projectile and that of the travelling magnetic waves which move it — the circular reactance of the induced current paths will take different values as the projectile gains velocity in the gun. This change of reactance is unavoidable, so the maximum thrust cannot be continuously maintained. Nevertheless, by having the resistance and reactance factors reach equality at maximum velocity comparatively little is lost in the way of thrust. Since the reactance is greatly affected by the wave speed, the slip, and the diameter of the projectile, the resistance factor must be adjusted to meet these conditions. By proper selection of materials and wall thickness, the shell of the projectile can be made to strike a reasonable compromise among the factors of weight, mechanical strength, and resistance. When the diameter of the projectile is large or the frequency is high, the construction of the projectile shell tends toward thinner walls and alloys of high specific resistivity. On the other hand, low frequency and small diameter indicate thicker walls and high conductivity. Where large diameter and high frequency are combined, it becomes a problem to have high enough resistance without seriously sacrificing mechanical strength. One means of overcoming this difficulty is to slot the cylinder in such a way as to interrupt the normal paths of the induced currents and cause them to flow in tortuous paths. 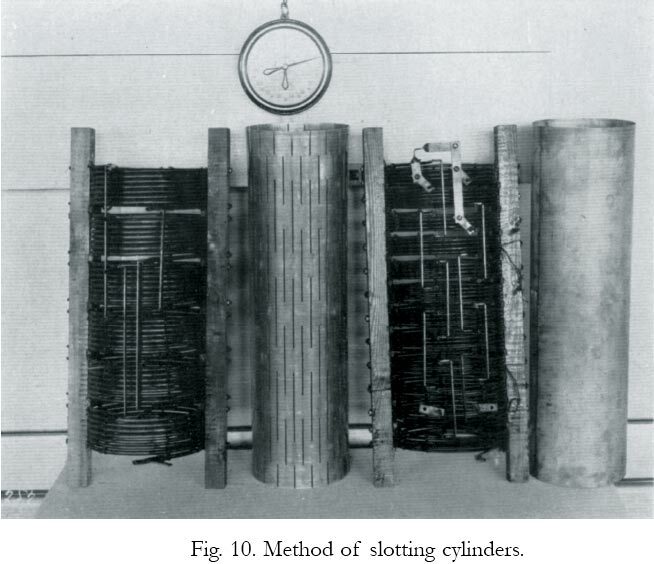 When handled properly, this device of slotting has a great effect on the resistance of the current paths without greatly changing the reactance. Moreover, even with considerable slotting, a cylinder will retain a great part of its original strength and rigidity. An aluminum cylinder slotted for experimental purposes is shown in Fig. 10 below. Where slotting is impractical and the projectile wall is extremely thin, the necessary mechanical strength can be obtained by having a supporting cylinder made of a nonconductor such as bakelite or fibre.